CATIA V5 is the newest release of the long-standing 3D CAD software from Dassault Systemes. It is the first full release to be available on the PC platform (NT). There are many changes over the previous UNIX-based V4. This quick demonstration will outline one basic approach to 3D design. 1. Solid model creation of 3D objects has become much easier. To begin with, we should use the 'Mechanical Design' Workbench. We want to create an arc segment and a horizonal centerline for revoltion surface later. 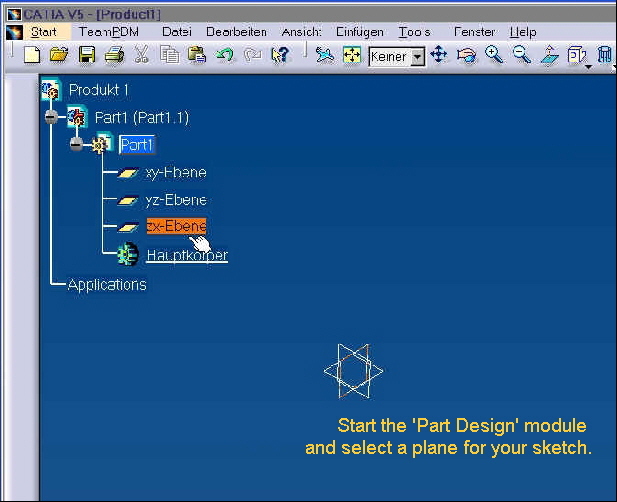 As with CATIA V2 - V4, wireframe geometry creation begins with the selection of a plane. We will select the ZX plane for ourselves. Select the plane directly from the display or from the Product tree. In both cases, the selected element should be highlighted to indicate it has been selected. 2. The sketcher can be started on the selected plane with the 'Sketcher' Workbench. The display will change to a 2D grid, and the sketcher icons should apear on the toolbar. We want our arc segment close to the axis, but stll fairly flat - 205mm Radius with centerpoint 200mm away from H axis..
3. We first draw our horizonal centerline for our later surface of revolution. We draw a horizonatal line well under the (H)orizontal axis. We may specify its distance from the H axis by using the CONSTRAINT function and then selecting our line and (H)orizonal axis. A green constraint dimension representing the distance should appear. Use the left mouse button to fix it in position. 4. Double-click the new distance constraint. A dialogue box should appear. Enter the Radius dimension "200"(millimeters). Now we want to create our arc segment. One way to create an arc segment is to trim a circle to endpoints. We create a circle with the "CIRCLE" function. Using CONSTRAINT, we will specify a 410mm diameter (R205mm), and a distrance of 200mm between the (H)orizonal axis and the circle's centerpoint. We will create two vertical lines and use the "TRIM" function to create our arc segment. 1. Create two vertical lines that intersect the circle above. 2. Constrain the distance a) between the two vertical trim lines and b) between one of those two trim lines and the (V)ertical axis. Specify a distance between the (V)ertical axis and one trim line at 25mm, and a distance of 50 between the two trim lines themselves. 3. Click the TRIM icon, then the circle and one trim line. Repeat process with the second one. You must probably also constrain a distance of '0' between the circle's centerpoint and the V axis. The above method was discussed so that you would like the next mothod even more:-). Using the 'CTRL' key, many entities may be selected at once for setting a constraint. This is the real key to setting many SYMMETRICAL constraints. 1. You will have to find the ARC function (it might be hiding under the CIRCLE sub-panel). We will select the left endpoint of our centerline for our arc segment's centerpoint. Drag the mouse upward, above the (H)orizontal axis, and click the left mouse button to create the arc segment. 2. 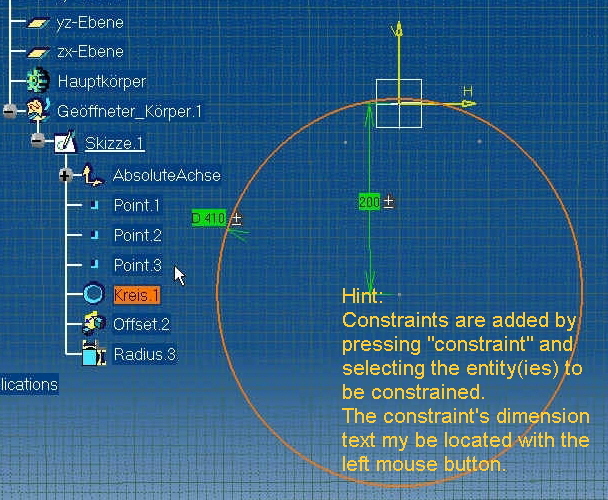 Add a radius constrain to the new arc segment by selecting it and clicking the CONSTRAIN icon. 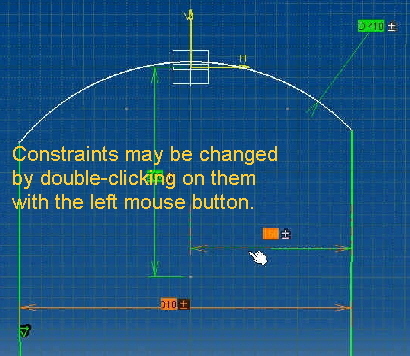 Use the left mouse button to fix the constraint's position. 3. Double-click the new radius constraint. A dialogue box should appear. Enter the Radius dimension "205"(millimeters). 4. Select the CONSTRAIN function and the two endpoints of our arc segment. After fixing the constraint's position in the workspace, change its value to "50". 5. Using the CTRL key (or Strg), select both endpoints from the arc segment again. While still holding the CTRL key, also select the (V)ertical axis. Select the constraint function. A dialogue box listing available constraints should appear. Select 'SYMMETRY'. This quickly establishes exactly what we want: an R205 arc sement with a horizontal length of 50, using the (V)ertical axis as our line of symetry. You may exit SKETCHER using EXIT.